Bisbee's story is one of the great mining stories of America. On December 14, 1877 three prospectors, Hugh Jones, Joseph Halcro and Harry McCoy, after discovering a copper stained outcropping of rocks filed a claim on the first copper mine in the area. By 1879 one hundred claims were filed and a mining camp had begun informally known as Mule Gulch. The original, and largest, claim at that time was known as the Copper Queen mine. Investments were needed and its search for investors lead to Judge Dewitt Bisbee. Thus in honor of the camp's major mine financier, Judge Bisbee, the blossoming new town was named Bisbee, With the camp's major mine now financed and the mining camp's growth into a new town, Bisbee was ready to become one of the most important mining cities in America. In 1881 Phelps, Dodge, and Co. purchased the Atlanta, next to the Copper Queen, and in August 1885 a merger had brought the two mines together. The railroad had come to Bisbee in 1889 and by the mid to late 1890's Phelps, Dodge, and Co. had now owned 90% of the Copper Queen Consolidated Mining Co. and had purchased most of the other mining properties in the area. Copper was being produced in Bisbee for decades. In the early 1950's work began on Sacramento Hill, a large low-grade copper ore pile. Harrison Lavender, the manager of the Copper Queen, had determined an open pit mine would increase ore yield. On December 14, 1974, twenty years later, mining had stopped and the thousand foot deep Lavender Pit covering 300 acres had replaced the hill. The Lavender Pit had become a tourist destination with rim viewing platforms and guided tours. Check out our hand cut Bisbee Turquoise Cabochons! We carry every grade of this rare American Turquoise icon in cabochons. We have deep blue, medium blue, light blue, green, "Smoky Bisbee", and Spiderweb Turquoise cabochon from the famous Southern Arizona mine. All gemstones are 100% genuine Bisbee and have been hand Cut by John and Dillon Hartman of Durango Silver Company. 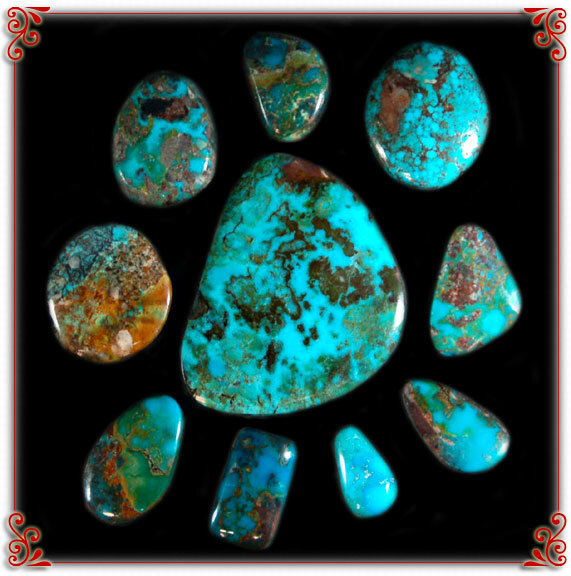 Shop For Geniune Bisbee Turquoise Cabs now!